The Beginning Teacher Leadership Network (BTLN) held its first meeting of the year Thursday, September 21. The evening commenced with new and returning BTLN members trickling into Tobacco Road Sports Café after a hard earned teacher workday and soon got underway as we enjoyed a scrumptious fajitas bar. The kickoff was hosted by one of our own members, Taura Simmons, an ESL teacher from Zebulon Middle and a member of the BTLN leadership council. As the evening unfolded we met the other members of the leadership council: Christina Kern (Dillard Drive ES), Christina Spears (Apex Friendship HS), Jacqueline Brunch (Barwell Road ES) and America Moreno (Sanderson HS), as well as the program coordinator of our Wake cohort, Teresa Pierrie, from our friends at WakeEd Partnership. By the way, we are excited to announce and welcome our newest leadership council members – Jere’ Wilder (Lincoln Heights ES) and Erica Everett (Moore Square Museum MS)! After networking and enjoying a delicious catered dinner, we continued developing our leadership skills with the help of Dr. Julie Crain. 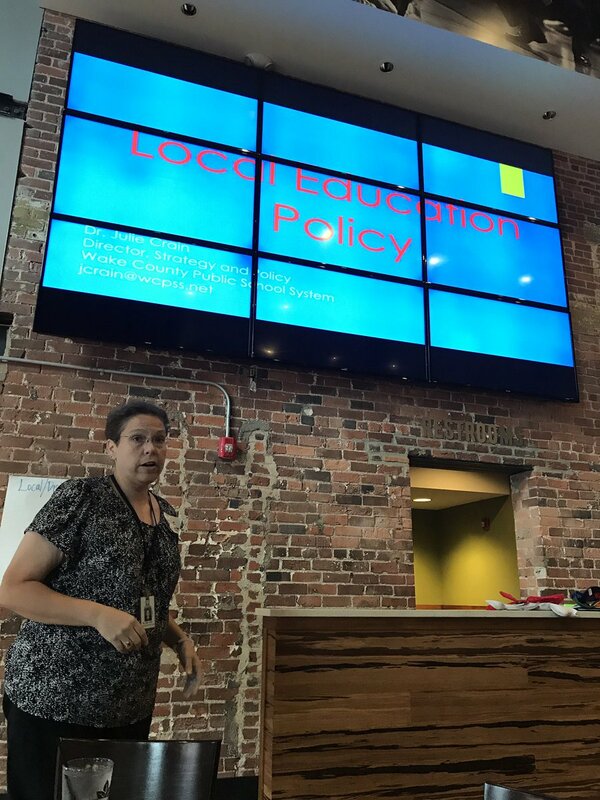 Dr. Crain, the Director of Strategy and Policy for Wake County Public School System, led us through various levels of local and state policies that affect education. This included how to find and navigate WCPSS policies as the County transitions from an old to new manual, and corresponding policy legislation. Thank you, Dr. Crain, for taking the time to empower our Beginning Teacher Leaders. During the second part of the evening, BTLN members took time to share their thoughts and ideas about what they want to gain from participating in the program. 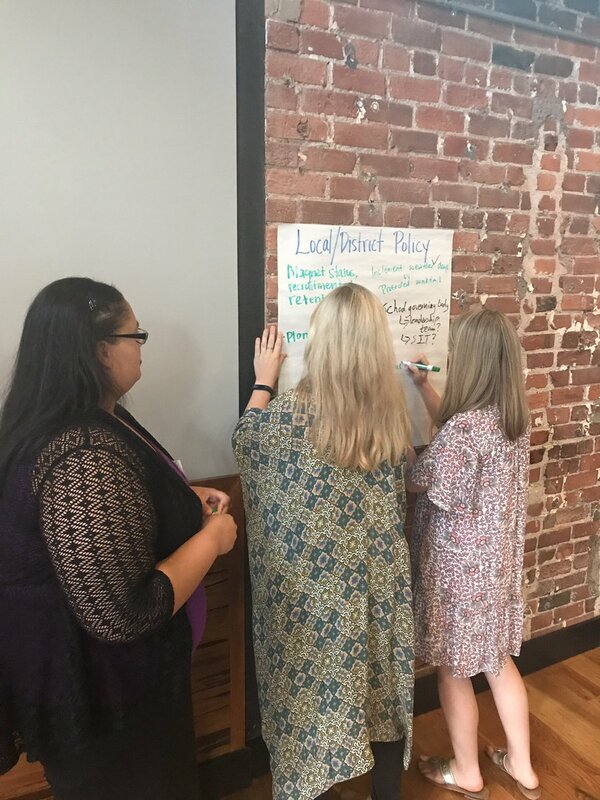 Teachers networked while brainstorming ideas, issues, and policy topics that would be of interest as the year progresses. We will explore these member-selected choices within the overarching categories of curriculum, technology, classroom management, parent communication, local and state policy, racial equity and social justice in future BTLN sessions. If you were unable to make it to the first session, but would like to share your input about what you would like to experience this year through participating in BTLN, please reach out to a member of the leadership council or send an email to Teresa at tpierrie@wakeed.org so that we ca n take your voice into consideration as we begin to plan our future meetings. We also invite you to browse the BTLN Yearbook set up in Google Classroom to begin to get to know your fellow members. Please take a moment to fill out your own yearbook profile page if you have not done so already (you must be logged into your WakeID and use the code q0m0mt2 to join the Google classroom). If you’re on Twitter – and we hope you are! – use the hashtag #WakeBTLN to connect with the WCPSS cohort or #BTLNNC to connect with other BTLN cohorts across the state. Be sure to also follow the NC Public School Forum, WakeEd Partnership and WCPSS at @wakeedpa, @wcpss @theNCForum, respectively. We are looking forward to our next meeting on Thursday, October 19th at Marbles Kids Museum beginning at 4:30. We are honored to have Bill McNeal and Tom Oxholm as our special guests. They will dialogue about the history of WCPSS and how it has shaped over the years into what it is today. If you like history, you won’t want to miss this session! We will also have an opportunity to chat with these two power hitters about things you want to know.